The FTD Precious Peace Arrangement is an exquisite display of serene wishes and grace. 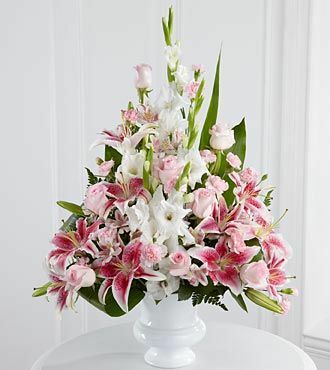 Soft pink roses, Peruvian lilies and mini carnations are arranged amongst dazzling Stargazer lilies and white gladiolus, gorgeously accented with lush greens. Perfectly situated in a white plastic designer urn, this stunning arrangement will add to the beauty and elegance of their service or memorial. Approximately 36H x 24W.